Once you have learned the basics of Aromatherapy, there will be no stopping you. You'll want to continue learning and working with herbs and essential oils. You may even start your own side business making products to sell online or even in stores. As the demand for all natural products and alternative healing continues to grow within the West, there are more opportunities for those who are willing to learn about this ancient art than ever before! People have relied on over the counter remedies purchased at the drugstore for years. Many of these remedies are ineffective and most of them can be toxic if used on a long term basis. They contain synthetic chemicals. Aromatherapy is the art of healing yourself naturally, using products derived from nature. There is nothing synthetic about Aromatherapy. It is simply the art of being in touch with nature and realizing that everything that we need to surivive and live a healthy life is here on earth for us to use. We just need to know how to use it. Today, there is a book that can tell you how to use Aromatherapy not only as a healing method, but to help others as well and even start your own business. You have probably heard about Aromatherapy but have no idea how to use it or even find the products for making Aromatherapy products. You may even get essential oils and perfume oils confused. You have probably purchased synthetic products in the store that claim to be "aromatheraptic." Once you read this book, you will realize the difference between true Aromatherapy and sythetics. You will then learn about the different types of essential oils and how they can be used for healing or in beauty products. If you are like so many people who are tired of using synthetic products that get little results, or consuming chemicals that are toxic for the environment, or even if you just want to improve your life a little, "How Aromatherapy Can Change Your Life" can teach you everything you need to know to get started in this ancient healing art. In addition to learning about the art for itself, there are recipes for products to make as well as a full glossary of the most popular types of essential oils and how they can be used for both healing as well as in beauty products. Whether you want to use them as a topical solution or as a scented healing method, there are many differnet ways to use Aromatherapy in all aspects of your life. Once you learn the concept of how to use certain oils and other natural ingredients, you can discover many different ways to heal using these varied methods. In "How Aromatherapy Can Change Your Life," you will have all of the information you need to learn how to start using this Eastern art to your advantage. 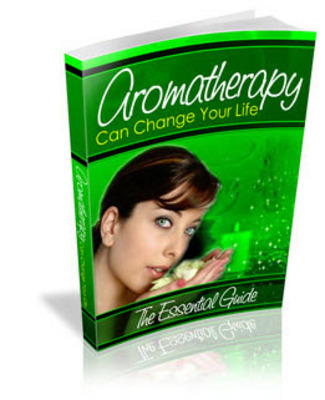 "How Aromatherapy Can Change Your Life" will not only give you easy to understand uses for Aromatherapy, but will also give you many different "recipes" for making products that can be used for healing purposes or beauty products. You can even get practical business tips on how to turn Aromatherapy into a home based business. Everything you need to get started in Aromatherapy, this exciting new alternative lifestyle, is here in this book. For only $17, you can start learning about the many healing powers of Aromatherapy and how incorporating this into your life can change it for the better. Most books will teach you a thing or two about Aromatherapy, but they usually get bogged down with a lot of technical information that you will never use and never need to know. If you want to learn how to use this ancient healing art without all of the "fluff" that is put into other books, if you want easy to use recipes for different products, a concise glossary of oils and even places to purchase the oils, "How Aromatherapy Can Change Your Life" is for you. This book will teach you everything you need to know to get started changing your life for the better by using nature. From helping you get out of a slump to healing aches and pains, Aromatherapy is a tried and proven healing method. Many people purchase creams and lotions as a way to improve their life and have no idea what they are buying. In most cases, they are simply purchasing immitations of products, usually at three times that it would cost you to make the same thing using real products that can actually work to heal. If you want to change your life for the better using healing treatments that incorporate nature and have worked for thousands of years, you can do it. If you want to learn about the healing arts of Aromatherapy either for your own use or to start a thriving business, everything you need to get started can be found in "How Aromatherapy Can Change Your Life." This easy to read and very informative book will give you precise information on just exactly how you can start improving the quality of your life right now. If you have been looking for a way to get back to nature and learn more about Aromatherapy healing, you have found it here with "How Aromatherapy Can Change Your Life." Remember when we talked about how learning to incorporate the ancient healing powers involved in Aromatherapy can truly change your life for the better? This is not a just a boast, it is true. By following the simple tips and ideas outlined in "How Aromatherapy Can Change Your Life," you will find practical tips on using all natural oils and products in both healing and beauty and even how to embark on an exciting new business! How Aromatherapy Can Change Your Life! aromatherapy;healing method;natural prod 82956820 9.95 stockjock Fresh Download Available!